Home » Body and Skin Care » Consumer Products » Fight off Body odour with Nivea's Body Deodorizer! 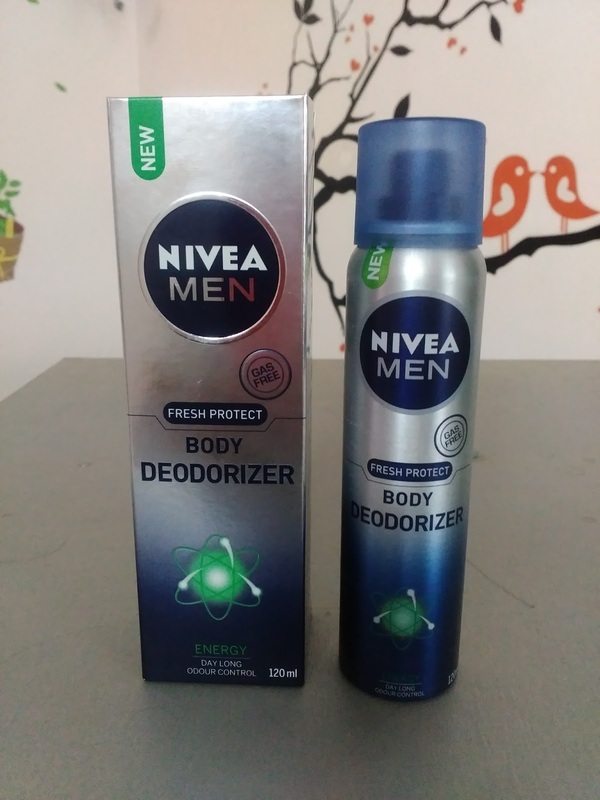 Fight off Body odour with Nivea's Body Deodorizer! Two weeks back when I had applied for the #SniffSniff activity (the activity was meant for male bloggers from Mumbai, Delhi and Bangalore) on BlogAdda, I had no idea that I would be among the lucky few who would get selected to participate in the fun activity. 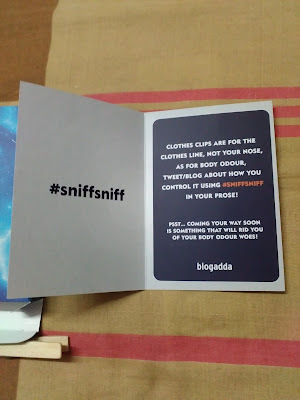 I felt so happy when I got that email from BlogAdda, informing me that I had been shortlisted for the #SniffSniff activity. The chosen bloggers were going to receive an item each on three different days over a period of one week and we had to take a guess at what the actual product could be. In fact those items were actually clues or hints for guessing the actual product that we were going to receive on the 4th day. 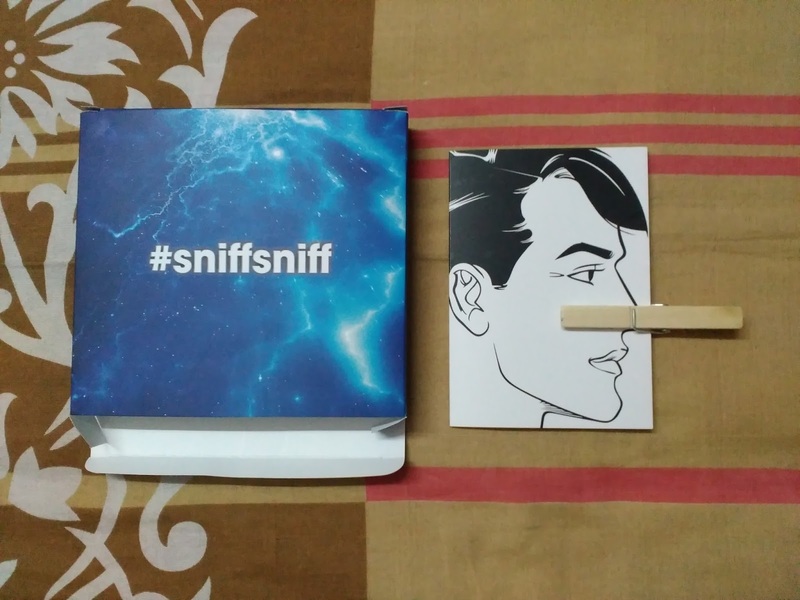 As a part of the fun activity, a mystery had been built up around the product, we had no idea what it could be, though I had taken a wild guess (and ultimately it was proved right, that the product would be related to body odour). Still I wasn't sure about it then. 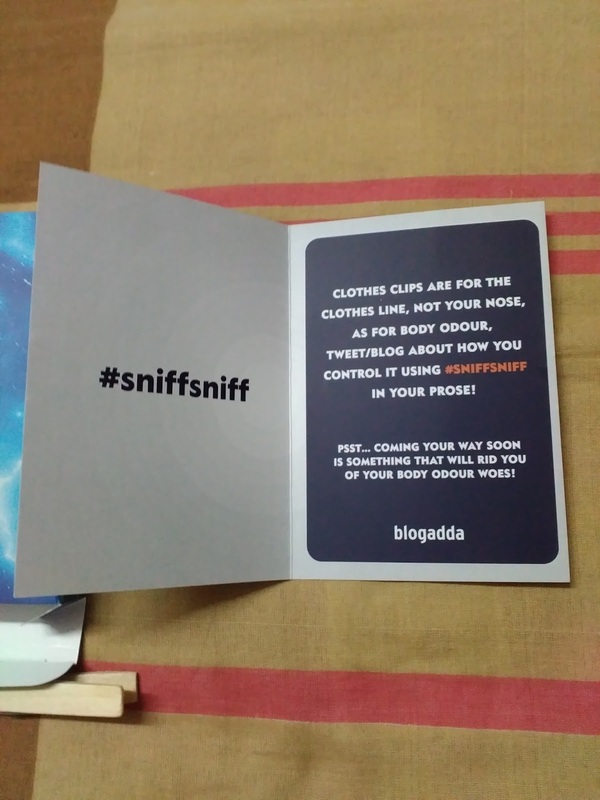 Thus the mystery around the product had captured my imagination right from the first day when I was sent this card -- a wooden clip pinning the nose of a man drawn on the card and the message read, "Clothes clips are for the clothes line, not your nose". My guess was right, that it was related to body odour. But I was still not sure what it could be, it could be a deodorant or a perfume or probably a scented soap. 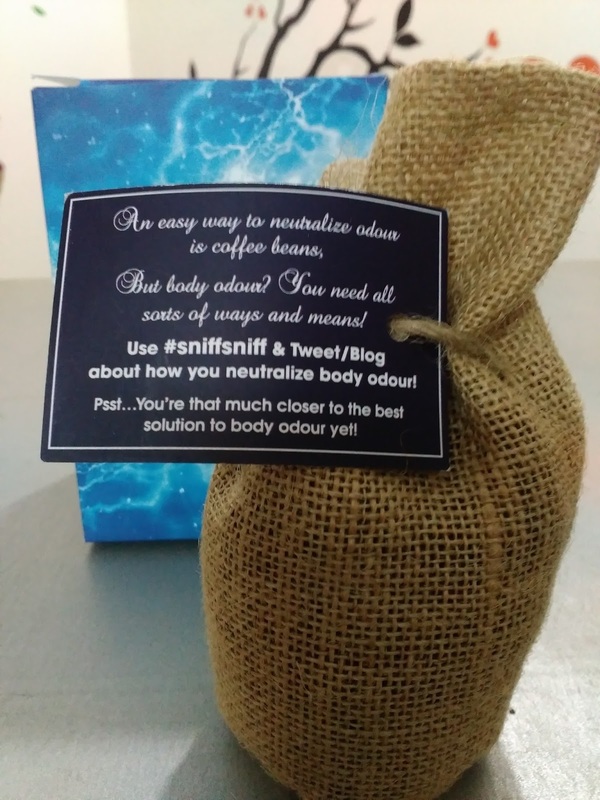 Two days later, the second parcel also arrived, it had a small sack inside that contained coffee beans and a card attached to it read, "An easy way to neutralize odour is coffee beans. But body odour? You need all sorts of ways and means!" 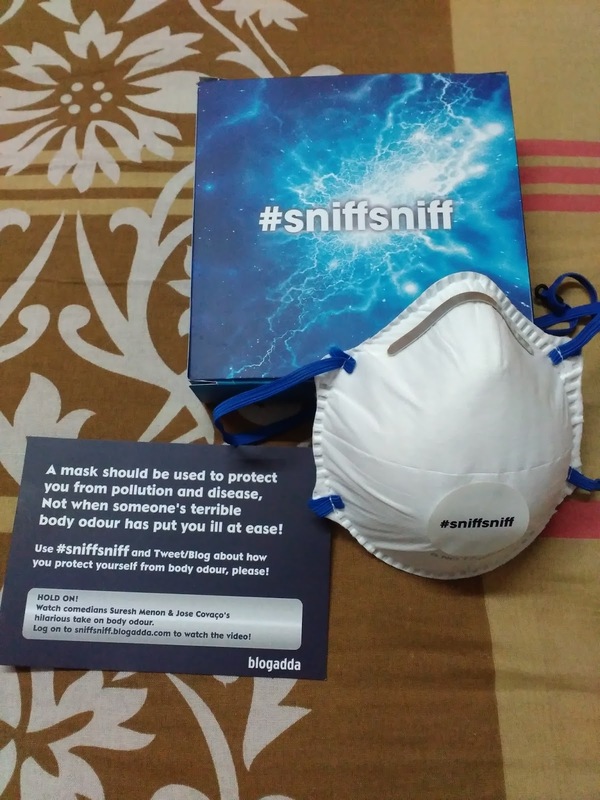 Then on the third day, I was sent a mask, along with a card that read, "A mask should be used to protect you from pollution and disease, not when someone's terrible body odour has put you ill at ease!". All the while, me and my friends had been taking guesses at what the product could be but the mysetry continued. And finally on the 4th day (it was a Sunday) the suspense over the actual product was unveiled when the final parcel arrived. It contained Nivea body deodorizer, India's 1st, that would fight off body odour. My joy and excitement knew no bounds because Nivea stands for trust! I’ve been using Nivea products (moisturizing creams, deodorants, soaps and shaving gels) for quite some time now, almost everyone in my family uses Nivea products. In fact it was my father who introduced me to Nivea. Even when I was a child, I had seen Papa using Nivea face cream. Well, not for nothing is Nivea trusted for generations, the brand's name is synonymous with quality skin care products all over the world. No wonder it has succeeded in building an enviable reputation of being one of the most trusted skincare brands. In fact since the last few years, I have been using its deodorants (they come in three or four variants) and they work really well. After having tried out the other brands, I finally settled for Nivea and I haven't been disappointed. So when I got this can of Nivea Body deodorizer, I was very enthusiastic and had got huge expectations from it. Oh, boy, did it not not succeed yet again! Yes, it did.